"Some Americans reaction was to regard all Muslims as enemies, but it was clear to most that they had to make a distinction between one of the world's great religions, and the fanatics who had taken it to violent extremes." This impressive History Channel documentary explores the origins and teachings of Islam, one of the world's great faiths, and in doing so takes a noble step forward in attempting to clarify and explain what many Americans have perceived as a religion of pure hatred and evil, especially in the days following the destruction of the World Trade Center. Fears and concerns of things we do not fully understand is a seemingly unavoidable human trait, and Inside Islam is the kind of well-researched, objective piece that should really should be seen by anyone who has ever wondered the who's, how's and why's of what is undeniably the world's second largest religion. 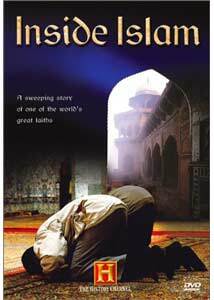 Prior to watching this DVD, my working knowledge of Islam was (in hindsight) apparently extremely limited, and consisted of what I considered a simple, cursory understanding of the facts; after watching this disc I realized what I had known was largely incorrect, and what I didn't know was truly eye-opening. Over the course of 90 minutes, Islam's close connection with Christianity and Judaism, the overflow of common ancestry, along with the expanding and fracturing of the religion is fully explained with the kind of even-keeled textbook objectivity that A&E and The History Channel are so well known for. Gulf War "Scud Stud" Arthur Kent introduces a few segments, and acts as the on-camera de facto host, while familiar deep-voiced Keith David handles the narration, in between comments from a number of religious writers and educators. The first sixty minutes covers everything from the 7th century through World War I, while the final thirty is devoted to more modern events, including the return to more puritanical fundamentalism amongst certain extremist sects, as well as the rise of the Nation of Islam in America. I imagine it is difficult to encapsulate the full breadth and scope of a diverse global religion in 90 minutes, but Inside Islam presents the expanse of material in an easy-to-follow logical flow that will probably startle you with some of its revelations. Personally, I feel better educated and more knowledgeable for having seen it, and I while I am far from being a religious scholar, the wealth of information presented made me feel as if I learned something that a large portion of the world knows already. Image Transfer Review: Presented in its original 1.33:1 full-frame, the content for this television documentary is compiled from a number of different sources, and as such the quality varies slightly. Some footage is grainier than others, but by and large it all looks presentable. Audio Transfer Review: Inside Islam is presented in 2.0 surround, and Keith David's voice resonates beautifully and clearly. The Middle Eastern-tinged background music is sharp and crisp, with no noticeable hiss or crackle. Nothing flashy, but more than serviceable. Extras Review: A Timeline of Islamic History is the only extra, and unless you have a large screen the tiny, tiny text may prove problematic to read. The disc is cut into 15 chapters, and does not feature any subtitles. Over the closing credits, Arthur Kent touts an upcoming History Channel show tracing the origins of radical Islamic groups as "coming up next." It is not, however, on this disc, and was apparently another program broadcast after Inside Islam originally ran. If your knowledge of Islam is limited to only what you've seen on the news, you owe it to yourself, and your entire family for that matter, to see this wonderfully insightful documentary. It's unfair to let ignorance breed contempt, and I think a boxed set of A & E/History Channel documentaries on all the great religions of the world would be an outstanding idea.